Yahoo! had a huge bike fair at their main campus in Sunnyvale, California. Five lucky winners got this special purple edition of the Specialized Globe Comp IG8. The Globe is Specialized’s line of hybrid commuter bikes, and this particular model is equipped with carbon fiber forks with rack mounts and the Shimano Nexus 8-speed internal gearing hub. This bike also features 700×42 flat-resistant road tires. Yahoo! does a very good job promoting alternate modes of transportation for their workers, with 36% of workers getting to work via means other than single-occupant motor vehicle, which is probably some kind of record for a U.S. company of their size. 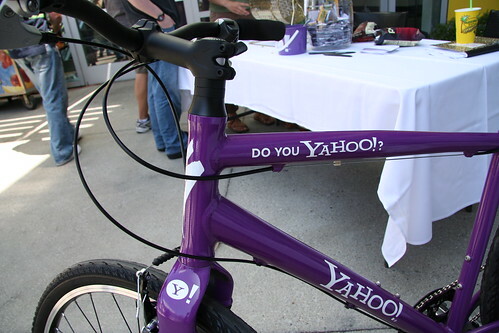 They have the usual array of things pushed by all of the other Silicon Valley companies such as Ecopass, Commuter Checks, shuttles and the like, but Yahoo! also really push bicycling as a way to get to work. Photo Credit: “Pretty sure you wouldn’t misplace this” by Yodel Anecdotal.